In March 2016 I had the honor of being invited to Horse of the Sun Ranch in Pine Valley, CA. I was asked to give a 4-day clinic for the Staff, Program Directors and two Wounded Warriors who participate in programs offered at the Ranch. The Founder and Board President of the Ranch, Jerry Hall, hosted the event. This was my first experience working directly with Wounded Warriors, I have a feeling this is definitely not my last. I have known three staff members, Bob King and his wife, Betty and Suzi Zelinski for many years. Bob teaches horsemanship and roping and is perhaps one of the best teachers I have ever known. He is the consummate student, which is what makes him such a good teacher. Bob never gets frustrated or angry when someone can’t “get” what he is trying to teach. Instead he finds ways to show, explain and clarify what he is saying so that the student can understand and achieve the goal. Bob’s strong faith and military experience (having served in the Navy on a submarine) makes him a perfect fit for the job at Horse of the Sun. Bob’s wife, Betty helped with meals and probably much more than I am aware of behind the scenes. She brings a quiet stability to the program. Betty is always thinking about life and while she seems to be in the shadows I know from experience she is gently watching to see that all runs smoothly. Suzi Zelinski’s smile is infectious. She moved to San Diego to take care of her aging father and was there when Bob needed a hand with the horses at the Ranch. Suzi has worked with me for years and embraced my use of the Feldenkrais Method® for her own healing. She is committed not just to Feldenkrais techniques but also the philosophy behind it, which is based on the Socratic method of asking questions. 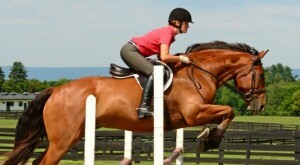 Her experience with horses is extensive, covering a variety of disciplines. She works around the horses with a calm, steady and peaceful quality that is soothing to both horses and humans. When I arrived at the Ranch, a beautifully refurbished equestrian facility with stabling, outdoor and indoor arenas, housing, offices and out buildings, I was introduced to John Mayer, retired Marine Colonel and Director of the Jinx McCain Horsemanship Program, which is named for a Vietnam-era colonel who hosted trail rides for wounded veterans at Camp Pendleton, CA in the 1960’s. The Jinx McCain Program is funded by the Semper Fund, which was started in 2004 by Marine spouses to support wounded, injured or ill Marines. Since then Semper Fi Fund has started the America’s Fund, which serves all branches of the military. These Funds provide the necessary means to get the veterans to Horse of the Sun Ranch, who then covers the costs of providing its specialized programing. John is a high-energy guy who is 150% committed to his Wounded Warriors programs. Having loved horses all of his life and served as a Marine for 33 years he believes that “the best thing for the inside of a person is the outside of a horse”. In addition to monthly advanced clinics at the Ranch, John provides working experiences for Wounded Warriors such as gathering and sorting cattle in Wyoming. He has also become Director of an apprenticeship program that teaches cowboy trades to wounded veterans as an alternate profession to a desk job. Additional guests include two Wounded Warriors from the Jinx McCain Horsemanship Program, Misty and Jeff. This was my first time working directly with Wounded Warriors and seeing what these brave men and women deal with on a daily basis as a result of their injuries. 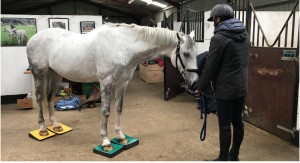 It was very exciting to see the changes that happened using many of the tools which are incorporated into the Murdoch Method including the SURE FOOT® with both horses and humans. In two days Jeff, a former seaman who struggles on dry land, recalled his martial arts training after stepping over the SURE FOOT Balance Trail. Offering him the “horse iris eyeglasses” changed his vision and improved his focus and balance. I handed Misty the Heart Math hand held unit to help her calm down and sleep at night. While it didn’t improve her sleep it did help her find a way to be more relaxed. In addition we discussed how to adapt Western saddles to be more comfortable for the Warriors by shimming the stirrups, using bands to hold the stirrups back and making a crown in the ground seat to be more comfortable especially for the women. The story of Horse of the Sun begins when Jerry met Bob in Wyoming at “Cowboy School” in 2003. Ever since he wanted to create a similar school, making it available to those in need and who would benefit from equestrian and nature-based programs. Jerry and his wife Jill purchased and refurbished a 32-acre horse facility near San Diego nestled in the foothills of the Cuyamaca Mountains. Now retired, Jerry guides the Ranch along with a Board of Directors. Jerry is unassuming (one would never guess he is a retired COO of an insurance firm), eager to learn and enthusiastic about the horses and programs offered at the Ranch. His dedication commitment to quality and outreach in order to make programs available to those in need was evident from the moment I met him. While there were times when he wasn’t quite sure where I was going, he hung in there and afterward appreciated my perspective. I guess I must have made quite an impression as I have been asked to be a Horse of the Sun Honorary Board Member! When asked to be on the Board my first thought was, “I must be getting old” as this is the first time someone has approached me to serve as an ambassador for their program. My second thought was “I must have made an impression”. So it is with great pleasure that I have accepted the position. Horse of the Sun Ranch provides opportunities to those in need, particularly Wounded Warriors to be with horses and nature. 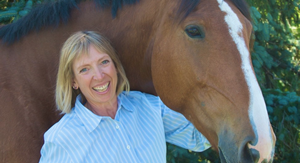 The excellent facilities nestled in the foothills outside San Diego, CA and knowledgeable staff provides an educational program, which allows individuals to connect with the healing power of horses enriching the lives of all concerned.